We are a top-notch organization, engaged in providing Skid Mounted Process Module. In order to meet excellent quality standards, we are supplying Skid Mounted Process Module. 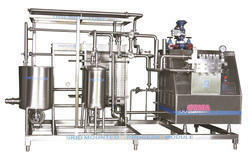 We are a noteworthy organization in the domain, engaged in providing high quality range of Skid Mounted Process Module. Our reputed entity is engaged in supplying Skid Mounted Process Module. Medium Used: Water, Air, cooling tower , steam etc. We are engaged in offering Skid Mounted Process Module. Banking on our enriched industry experience, we are able to supply Skid Mounted Process Module. Supplier of skid mounted process modules Consist of : Pasteurisers, homogeniser, s.s. sanitary pump, filter, control panel, s.s pipe line fitting etc. We are amongst the most reputed names in the industry, offering Skid Mounted Process Module.